Krispl-Gaißau is a village in the Tennengau region of Salzburg. 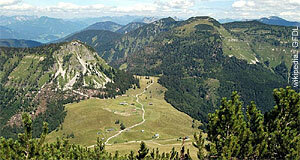 It is situated in the Osterhorngruppe mountain range, which results in manifold hiking opportunities. Krispl-Gaißau has a population of approximately 900. Effectively, is is two villages: The formerly two communities of Krispl and Gaißau were merged into one municipality. Both settlements are situated some 25 kilometres south of Salzburg. Gaißau is bigger than Krispl and locally known for its skiing opportunities, more specifically, for the Skischaukel and the Spielbergalm resorts. Opportunities for staying overnight are limited. The Osterhorngruppe is generally appealing for families and people who don′t want the "party" atmosphere of many of the internationally known ski resorts. Krispl-Gaißau, Faistenau and Hintersee are therefore popular with locals who appreciate the Osterhorngruppe for its vicinity and reasonable prices. For international visitors, however, the facilities might be less suitable in comparison to the jet-set places with their enormous hotels right by the slopes, ski rental opportunities and other services. Krispl-Gaißau is also very attractive for hiking during the summer months. The Wiestalkraftwerk power plant, which was built between 1909 and 1914, led to the formation of several small lakes from the trained river. Visitors can follow the course of this river. Fossil hunters will enjoy especially Krispl for the occurrence of petrified branchiopods and other marine organisms. For sightseeing, note that Krispl has a recently renovated, Baroque parish church. Krispl was made an independent parish in 1859.